In 1955 the Bell Model 204 won a US Army design competition for a utility helicopter suitable for front-line casualty evacuation, general utility and instrument training duties. The production version was originally designated HU-1, but this was subsequently changed to UH-1. The official US Army name for the helicopter is Iroquois. UH-1A Iroquois - initial production version powered by one Lycoming T53-L-1A turbo-shaft engine, derated to 770shp. Deliveries began to the US Army in June 1959. Thirteen modified to carry 70mm rockets and two 7.62mm machine-guns for service in Vietnam with the Utility tactical Transport Helicopter Company. UH-1B Iroquois - development of the UH-1A powered initially by one 960shp T53-L-5 turboshaft engine. Subsequent deliveries with 1100shp Lycoming T53-L-11 engine. Crew of two plus seven troops or three stretchers and two sitting casualties. Alternatively 1360kg of freight. For armed support missions could be equipped with rocket pack and electrically controlled machine-guns. Delivered from March 1961. UH-1C Iroquois - developed version of the UH-1B. New rotor with blades of increased chord offering higher speed and better manoeuvrability. Superseded UH-1B for the US Army, but was itself superseded by the Huey Cobra. UH-1E Iroquois - similar to UH-1B for US Marine Corps. Pilot and eight troops or 1815kg of cargo. Could carry rockets and machine-guns. UH-1F Iroquois - based on UH-1B. Twenty-five ordered by USAF for missile site support duties. Powered by General Electric T58-GE-3 turboshaft engine, derated to 1100shp and driving a 14.63m rotor. Pilot and ten passengers or 1815kg of cargo. First delivered in February 1964. Used for classified psychological warfare missions in Vietnam. TH-1F Iroquois - training version of UH-1F for USAF. HH-1K Iroquois - SAR version for US Navy. Twenty-seven ordered and delivered in 1970. Powered by T53-L-13 engine. TH-1L Iroquois - training version for US Navy, similar to UH-1E. Powered by T53-L-13 turboshaft, derated to 1100shp. Improved electronics. Forty-five ordered in 1968. UH-1L Iroquois - utility version of TH-1L for US Navy. Eight ordered; delivered in 1969. UH-1M Iroquois - US Army version fitted with Hughes Aircraft Iroquois night fighter and night tracker system to detect and acquire ground targets under low ambient lighting conditions. Three deployed with hunter-killer helicopter groups in Vietnam in 1970 to evaluate system. RH-2 - one UH-1A used as flying laboratory research vehicle. Model 204B - commercial and military export version of UH-1B with ten seats, 1100shp T5311A turboshaft engine and 14.63m rotor. Baggage compartment in tailboom. Over 60 commercial 204Bs delivered by end of 1967, in addition to military deliveries. UH-1P Iroquois Similar to UH-1F but used for special missions. Agusta-Bell 204B - utility helicopter, similar to Iroquois, produced under licence in Italy from 1961 to 1974 and sold to military and civil customers. By end of 1973 about 250 delivered, including the AB 204AS version for the Italian and Spanish navies, armed with two Mk.44 homing torpedoes or AS.12 air-to-surface missiles depending on anti-submarine search and attack or anti-fast surface vessel role. The US Army's first order was for three prototypes for testing, under the designation XH-40, the type having the H-40 designation allocated to it at that time to identify it in the USAF helicopter category. The first of these prototypes made its first flight on 22 October 1956, and these were used by Bell for test and development. Just before the first flight, six examples of the pre-production YH-40 were ordered, all being delivered by August 1958. One remained with Bell, but the remainder were distributed one each to Eglin AFB and Edwards AFB, and three to Fort Rucker, for trials. Duly ordered into production, nine of the definitive pre-production HU-1A were delivered on 30 June 1959, and were followed into service by 74 production examples, of which 14 went to the Army Aviation School at San Diego. The latter aircraft had dual controls and were used as instrument trainers. First major use overseas was with the 55th Aviation Company in Korea, and HU-1As were among the first US Army helicopters to operate in Vietnam. The Model 204 displayed its Bell parentage in the stabilising bar above and at right angles to the two blades of the main rotor, and also by the small elevator surfaces attached to the rear fuselage. Tubular skid-type landing gear was ideal for utility operations. Accommodation was provided for a crew of two and six passengers or two stretchers. Powerplant consisted of a 522kW Avco Lycoming T53-L-1A turboshaft, and this made the Model 204 the first turbine-powered aircraft, rotary- or fixed-wing, to be ordered by the US Army. The HU-1A was followed into service by the improved HU-1B, of which more than 700 were built, early production having the 716kW Avco Lycoming T53-L-5 engine, and late production models the 820kW T53-L-11 engine. Other improvements in the HU-1B included redesigned main rotor blades, and an enlarged cabin to accommodate a crew of two, plus seven passengers or three stretchers. In the autumn of 1965 the UH-1B was superseded in production by the UH-1C, which had an improved 'door-hinge' rotor with wide-chord blades, this new main rotor conferring some increase in speed and improved manoeuvrability. A few UH-1As operating in Vietnam were equipped with rocket packs and two 7.62mm machine-guns for use in a close-support role, and the success of these resulted in many UH-1Bs serving in a similar capacity, armed mainly with four side-mounted 7.62mm machine-guns, or two similarly-mounted packs, each containing 24 rockets. Other military versions of the Model 204 include the UH-1E for the US Marine Corps (generally similar to the UH-1B, but equipped with a personnel hoist, rotor brake and special avionics). The first being delivered to the Marine Air Group 26 on 21 February 1964, and from October 1965 Bell's new 'door-hinge' rotor being fitted to production aircraft; the UH-1F for the USAF, generally similar to the UH-1B but with a 962kW General Electric T58-GE-3 turboshaft, increased-diameter rotor, and able to accommodate a pilot and 10 passengers; a similar TH-1F training version of the above, for the USAF; the HH-1K SAR version for the US Navy, similar to the UH-1E but with 1044kW T53-L-13 engine; TH-1L and UH-1L training and utility versions respectively of the UH-1E with T53-L-13 engine; and three of the UH-1M with night sensor equipment for evaluation by the US Army. The Model 204B was built in small numbers by Bell, for civil use and military export. Generally similar to the UH-1B, these were of 10-seat capacity, had the larger-diameter rotors of the UH-1F, and the T53-L-11 engine. Model 204Bs and UH-1s have been built by Fuji in Japan, under sub-licence from Mitsubishi, and in 1967 this company introduced the Fuji-Bell 204B-2, which differs from the Model 204B by having a more powerful engine and a tractor tail rotor. Agusta in Italy is another of Bell's licencees, and has built the Model 204B in large numbers for both civil and military use, many powered by Rolls-Royce Gnome turboshaft engines. In 1955, the Bell Model 204 won a US Army design competition for a utility helicopter suitable for front-line casualty evacuation, general production version was originally designated HU-1, giving rise to the nickname 'Hueycopter', which survived the change of designation to UH-1. Official US Army name for the UH-1 series is Iroquois. HH-1K: Sea-air rescue version for US Navy, which placed a contract for 27 late in 1968, for delivery in 1970. The aircraft has the UH-1E airframe, T53-L-13 turboshaft engine (derated to 820kW) and revised avionics. RH-2 (Research Helicopter 2): One UH-1A was used as a flying laboratory for new instrument and control systems. Installations included an electronic control system and high-resolution radar in a large fairing above the flight deck, enabling the pilot to detect obstacles ahead of the aircraft in bad visibility. TH-1F: Training version of UH-1F for USAF. TH-1L: Training version for the US Navy. Similar to UH-1E but with 1,044kW Lycoming T53-L-13 turboshaft (derated to 820kW) and improved electronics. Contract for 45 received 16 May 1968; the first of these was delivered to the US Navy at Pensacola, Florida, 26 November 1969. 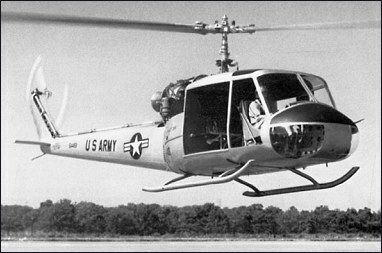 UH-1A: Initial production version, incorporating changes requested as a result of service testing. Six-seater, powered by a 641kW Lycoming T53-L-1A turboshaft engine, derated to 574kW. Deliveries to the US Army began 30 June 1959 and were completed March 1961. Thirteen, operated by utility Tactical Transport Helicopter Company in Vietnam, were modified to carry 16 x 70mm air-to-surface rockets and two 7.62mm machine guns. A total of 14 was delivered for use as helicopter instrument trainers with dual controls and a device for simulated instrument instruction. UH-1B: Development of UH-1A, initially with 716kW T53-L-5 turboshaft. Subsequent deliveries with 820kW T53-L-11. Crew of two and seven troops, or three stretchers, two sitting casualties and medical attendant, or 1,360kg of freight. Rotor diameter 13.41m. Normal fuel capacity 625 litres; overload capacity 1,250 litres. For armed support duties, a rocket pack and electrically controlled machine gun could be mounted on each side of cabin. Other armament installations tested on UH-1B. Deliveries began March 1961. This version was superseded by the UH-1C on the Bell assembly line, but production continued by Fuji in Japan in order to fulfil an order of 89 UH-1Bs for the JGSDF. HueyTug: It was announced on 3 September 1968 that a UH-1C had been retrofitted with a 2,125kW Lycoming T55-L-7C turboshaft and 15.24m 'door-hinge' rotor as the prototype of a new flying crane version able to lift a 3 ton external payload. Associated modifications, all of which could be applied retrospectively to existing UH-1s, include substitution of a 1,491kW transmission and larger tail rotor, reinforcement of the airframe and fitment of a larger tailboom, and use of a stability control and augmentation system instead of the normal stabiliser bar. Model 204B: Commercial and military export version of UH-1B, with 10 seats, 820kW T5311A turboshaft and 14.63m rotor. Tailboom incorporates a 0.99m3 baggage compartment, cabin doors with jettisonable emergency exits, passenger steps on each side of cabin, improved outside lights, commercial radio equipment, fire detection and extinguishing systems. First flight 8 March 1962; received FAA certification 4 April 1963. AB 204B: Agusta-built version of Bell 204B manufactured in Italy. DESIGN FEATURES: Two-blade all-metal semi-rigid main rotor with interchangeable blades. Usual Bell stabilising bar above and at right angles to main rotor blades. Underslung feathering axis hub. Two-blade all-metal tail rotor of honeycomb construction. Blades do not fold. Shaft-drive to both main and tail rotors. Main rotor rpm 295 to 324 (294 to 317 in UH-1F only). FLYING CONTROLS: Small synchronised elevator on rear fuselage is connected to the cyclic control to increase allowable CG travel. STRUCTURE: Main blades built up of extruded aluminium spars and laminates. Blade chord 53.3cm. All-metal tail rotor blades. The fuselage is a conventional all-metal semi-monocoque structure. TAIL SURFACE: Small synchronised elevator on rear fuselage is connected to the cyclic control to increase allowable CG travel. LANDING GEAR: Tubular skid type. Lock-on ground handling wheels available. POWER PLANT: One 820kW Lycoming T5309A turboshaft engine mounted above fuselage aft of cabin. Two fuel tanks on CG, immediately aft of cabin, total capacity 916 litres. ACCOMMODATION: Crew of two side by side, with dual controls. Standard model has bench seats for eight passengers, three abreast in centre row and five abreast in rear row. Optional layouts include individual chairs with tip-up seats or special interiors to customer's requirements, with optional settee, cabinet, writing table and glass-panelled dividing wall between crew and passenger compartments. Two doors on each side, front one hinged to open forward, rear one sliding aft. Compartment for 182kg of baggage. Passenger seats removable to provide 3.96m3 of accessible cargo space for loads of up to 1,360kg weight. Forced air ventilation system. ELECTRONICS AND EQUIPMENT: Standard equipment includes hydraulic power boost on cyclic, collective and tail rotor flying controls. Optional equipment includes full all-weather flight instrumentation, multichannel select VHF transceivers, visual omni-range and ILS course indicator with heading and glide slope presentation, ADF, VHF marker beacon receivers, Sperry C-4 navigation compass, Lear VGI 5 in all-attitude flight indicator, and external sling for 1,820kg of freight. The D and H models were bell 205's, not 204's, Army wanted a version that could carry more troops. Bell's solution was to stretch the HU-1B fuselage by 41 in (104 cm)Production started in 1963, the D models had the Lycoming T53-L11 and the H model had the T53-L13 1,400 SHP derated to 1100 SHP. i am currently doing a semster project in my AFJROTC class and this site really help me alot. i decided to do it on the UH-1 obviously, i chose the UH-1 because it is such a bueatiful and brilint helicopter and at the time it was design. ITS AMAZING, i hope to fly an orginal one day. Since i was a kid i'm fascinating with aircraft. most of them a Huey helicopter, or UH-1 army copter.. as it approaches overhead our place, we used to run chasing and trying to watch it flying beautifully, till now, specially when i realized and know the very importance of that aircraft,, i hope it'll still be an aircraft for many future generation..
To address the questions on the UH-1D/H they were based on the model 205, not the 204.
from flat rack container and loading to truck for inland transport to Calgary from Port of Vancouver, can you identify lifting points for us. I was with 1st AV BDE,10th BN, 92nd Assault Hel Co 1970-71. Flew about about a total of 900 hrs split evenly between UH-1C and UH-1M's fitted as gunships. Both the C & M had the 540 rotor system, same as the AH-1 Cobra minus SAS. SO there were more M's flown than the three indicated in this listing. Both were fine birds and served us well! stablizer bar ab ove the rotor and a longer mast. The original A model had a habit of main rotor blades cutting off tail fin during hard landings. I'm proud to have been on the airframe design team of Bell in 1956 and to have worked on the 204X and Y models. Little did i know then that this would become the DC-3 of the helicopter world. I never got to fly in one. Keep'um flying! Hope someone in the system told Gerry that he needed a full belly strap or use the jack points. as late as this is I'm sure he found out. Where is the info on the UH-1D and H model? They were the real work horses of Viet Nam. This is a very nice summary of the 204. Unfortunately, it fails to address the two models of the UH-1 that were the most produced and most used by the US Army. The UH-1D, and its successor the UH-1H, were produced in greater numbers than any other model, and logged more flight hours than any other 204 variant. Recommend some research on these models as well as some info concerning their employment by the US Army. Great site. The Huey is the DC-3 of the helicopter world, and always will be. I want to buy a new motor of boing 747. anubody help me. Chuck, I would like to talk to you on the land line. Mostly here after 7 pm,636-3393. Does anyone know of a source for archieval production/assembly footage of the UH-1/204 for a documentary? Does anyone have a copy of the original contract for these ships? Do you have detailed pics of the UH-1B. I am completing a 1/5 scale RC, needing pics from nose-to-tail. will be unloading damaged 204B from flat rack container and loading to truck for inland transport to Calgary from Port of Vancouver, can you identify lifting points for us. � The 'Huey' nickname comes from the original U.S. Army HU-1 designation.